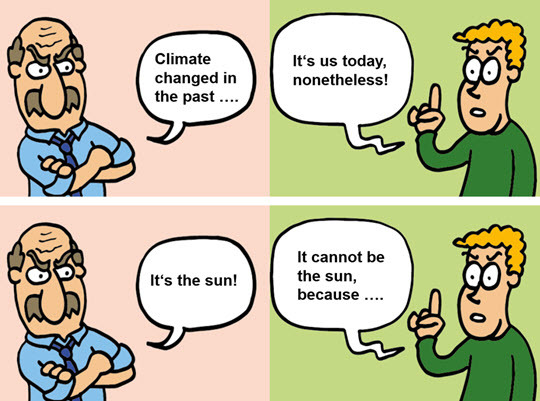 Today, many discussions about climate change happen on the internet. People interested in the topic share information and have lively discussions about the latest studies and findings. But, you'll also find many contributors voicing not just minor doubts about human-caused climate change but also those who outright deny it. In this blog post, I suggest some options which exist to deal with these dissenting voices. The suggestions are based on a presentation I prepared for the K3-conference in Salzburg in September 2017 and which I was invited to write about for the Promet journal published by the German Weatherservice (DWD). At a guess, you'll have noticed the following more than just once: As soon as an article about climate change gets published on the internet, it usually doesn't take long for comments voicing doubt or outright denying that it's human-caused to appear. Even though there's an overwhelming consensus of well over 90 percent in scientific publications and among climate scientists that the current climate change is human-caused, you can easily get quite a different impression from what gets posted on the net. How best to react to dismissive comments? One option is to respond directly and to debunk misleading statements with links to relevant and reliabe sources. This, however, can become very time consuming and leaves readers with the feeling that there are still more questions than answers. As it's very likely that the doubter isn't interested in the answer anyway, it can however make more sense to just use his assertions as hooks to explain the science to others actively participating in the discussion or passively reading along. For this to work, you'll need links to reliable resources which provide the information in an accessible format as well as links to the primary literature, like what we offer on Skeptical Science with our numbered list of more than 200 rebuttals. Referring to our list also drives home the point that the dismissive arguments have long and often been debunked. It also helps if you can add a graphic to your explanation and mention the characterstic(s) of science denial employed. Please check my earlier posts "New resource: The Fact-Myth-Fallacy slide deck" and "Handy resources when faced with a firehose of falsehoods" for some suggested and quick ways to debunk often heard misinformation. One point to keep in mind when employing the tactic to use a dismissive's comments as hooks for factual explanations is that you most likely will not get much feedback from those who only read along but don't get actively involved in the discussions. Chances are, that you are still having an effect, especially if you manage to keep your calm even when faced with ever more insulting comments! Tone does matter after all and people can tell the difference (but I admit that it would be nice to get more than the occasional "like" for comments posted!). To moderate or not, that is the question! "As it's very likely that the doubter isn't interested in the answer anyway..."
I agree, Deniers are not usually interested in the answer. This means it is pointless engaging them at all, and might even be counterproductive. To engage or not for the benefit of the "lurkers" is a bit problematic in my opinion. Because they provide so little feedback, you cannot be sure they even exist! [PS] Fixed links. Please learn how to do this yourself in the comments editor. I agree with the article on implicatory denial, but we cannot expect individuals to stop using energy, stop eating and to buy electric cars if theres no big efforts towards building a proper renewable energy grid. We need leadership from government and the corporates to build a 21st century energy grid. They are controlled by money in politics, fear of putting costs on voters, and the profit motive. End result: policy grid lock. Free speech is just a shorthand term that means people should be free to hold opinions without fear of state censorship or violence. Free speech is obviously not a licence to say anything in absolutely any context, go way off topic, fill websites with lies and blatant propoganda, and to threaten and insult people. Indeed such bullying speech shuts down free exchange of opinions by intimidating people. 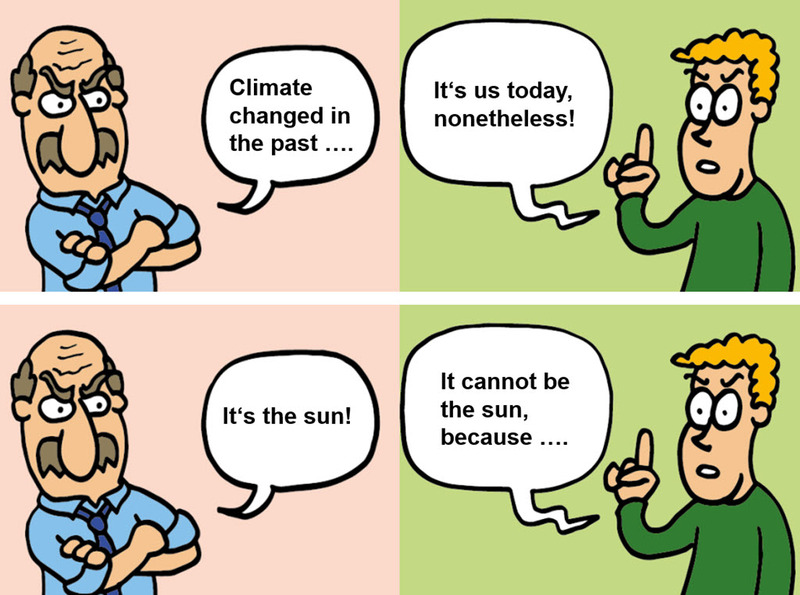 About 90% of the climate denialism seems to be based on logical fallacies rather than factual erros as such, so it makes sense to counter it by explaining the logical fallacies. I dont think this has been done well enough in the past, so its an opportunity for us. It's a paradox but many so-called "deniers" are eager to install the subsidised pv solar systems, so their denial is in words more than actions. On the other hand, lots of so-called activists do lead lifestyles with large carbon footprints. Which begs the question, is it better to be a climate change denier with pv rooftop and battery storage, or a climate change activist with a large carbon footprint? Art Vandelay, your "question" presents a false dichotomy ~ as I am sure you are aware! (judging by your implicit humorous wording). But I think there was recently an American survey showing something of that sort, where the "expected" difference was surprisingly small and even slightly reversed in some respects. Yes, a survey difficult to interpret . . . and possibly representing American Exceptionalism a.k.a perversity wrt climate science (I do expect that the rest of the world might show less strangeness, but I haven't seen related surveys which could confirm that). Unfortunately, fixing the climate problem requires top down action. Even converting half of each national population to a cave-dwelling zero-emission lifestyle (were that even possible) would be quite inadequate for appreciable success. Success requires political action "at the top" to really speed up the transfer to zero-nett-CO2-emission energy usage. That needs a sufficiently large voter bloc of concerned citizens, to overcome the present denialism and "capture by lobbyists & financial donors", which inhibits sensible statesmanlike activity by politicians. So in the end, it matters very little who flies more or who has more solar roof panels. And as we've seen recently on the streets of Paris, it also requires a sufficiently small voter block of persons adversely affected by top-down action. Paradoxically, again, many of the people marching in protest of higher taxes on fuel were the same people marching in September to promote climate change advocacy. The challenge for climate-concerned governments will be to make the hand of government less visible, and to find ways to motivate all citizens, concerned or otherwise, to embrace renewable energy. For some that might be the attraction of a much cleaner and healthier environment and a better quality of life - without harmful toxic air and water pollution, but for the majority it will need to be the potential to save money. Keeping in mind too that climate change advocates are already promoting (often strongly) the lower cost of renewables, so that promise will need to be (or seen to be) delivered at some point - soon. A side effect of a top-down solution, aside from the often divisive political implications, is that many (climate) advocates will feel that their vote for a climate concerned government is itself a "sufficient" action, effectively outsourcing their responsibilities as individuals. You're right of course, it doesn't matter who flies more or less or who has the largest pv rooftop installation. Emitting less means more "renewables" and less emissions, and until low or zero emissions air travel is realised, a lot fewer planes and a lot fewer people in the skies. The problem happening in France has to do with the fact that wages have been stagnant while fixed expenses have been rising. People of modest mens feel that they are being excessively burdened and there is validity in that opinion. Whatever the governemnt there is trying to obtain in revenue could probably be gained by just recovering money fraudulently hidden by the hyper-rich and corporations in tax havens over the course of a year. Air travel is not the most urgent emission source to tackle. Getting rid of coal burning and slowing deforestation would achieve far more than reducing air travel. Electrifying ground transportation would far exceed any gain achieved by reducing air travel. All these are technically possible to do soon whereas there is not yet a viable way to replace the energy density afforded by hydrocarbons to power heavier than air flight. Perhaps my background as a pilot and flight instructor makes me biased, but I see that there is far more to gain from phasing out coal and stopping peatland burning than reducing flying. That doesn't mean that we should not be keenly aware of our carbon footprint as individuals. 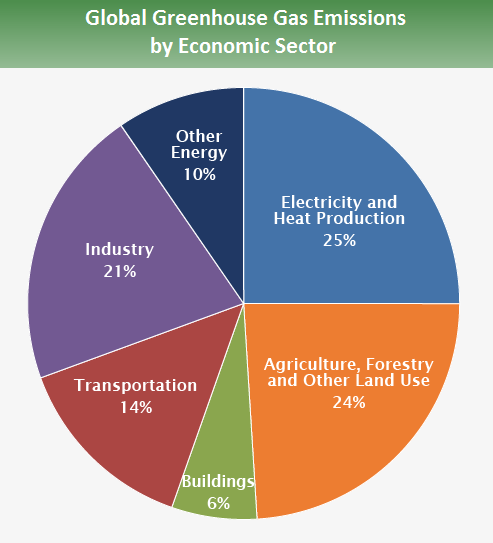 The IPCC attributes 14% of global carbon emissions to transportation. Among those, all of aviation represents a total of 4% total cumulative greenhouse effect, although the CO2 is only about 2%. I'm not saying it's not worth making some effort, but there are lower hanging fruits that are much more juicy, so to speak. Yes effective top down action requires the majority are comfortable with it, however the case of the French protesting against fuel prices is probably not an ideal or representative example. Refer article here. Its due to a combination of higher prices for fuel imports and extra taxes one of them being a carbon tax, so its the combination that has possibly pushed them into protesting. And the French protest about anything, believe me while other countries do not. The government indeed obviously needs to tread carefully with taxes. It looks like Macron chose the wrong time just when petrol prices are at a peak, which was obviously going to be temporary so he could have waited. In addition, the french carbon tax is not a tax and dividend scheme, so is quite harsh on consumers. The tax goes into funding a range of things, not just renewable energy. There's no escaping the need for a top down solution. Individuals cant build electricty grids and individuals are reluctant to reduce carbon footprints, possibly because they dont see many other people doing the same, hence the need for top down solutions of various kinds to get things moving. When people see some action they are likely to be more personally motivated. Some people might indeed tend to say its governments problem, but I think the vast majority have enough sense to realise mitigation requires both electricity grids and personal changes in behaviour of various types. Of course its important to show there are several things people can do to make a difference without waiting on governments, and which can only be driven by consumers, like reducing meat consumption and trying to be more economical with energy use. There are multiple benefits in such things as you also alluded to regarding renewable energy. Perhaps this needs to be used more in education campaigns. "Rebukes that this constitutes censorship or infringement of their rights to free speech can be safely ignored as there are many other websites - perhaps even their very own Facebook page! - where they can post whatever they want. 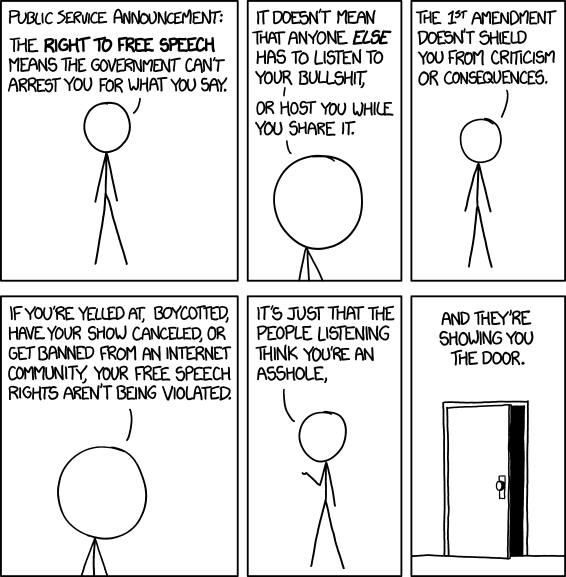 And if they don't get this message, you can always show them the door via XKCD's neat cartoon:"
When you look at the amount of money from individuals like the Koch brothers and corporations like Exxon Mobil, I don't see how climate change denial can be considered free speech in any sense. And more and more this denial is being funded in the same way drug cartels and terrorist groups move money around to avoid discovery. "The study, by Drexel University environmental sociologist Robert Brulle, is the first academic effort to probe the organizational underpinnings and funding behind the climate denial movement. It found that the amount of money flowing through third-party, pass-through foundations like DonorsTrust and Donors Capital, whose funding cannot be traced, has risen dramatically over the past five years. In all, 140 foundations funneled $558 million to almost 100 climate denial organizations from 2003 to 2010." Climate change denial has nothing to do with evidence and fair comment, it is essentially deceptive advertizing. And follows on from the same kind of deceptive campaign to prevent action in the public interest that tobacco corporations funded for years. When comments from such sources are removed and people who are quite likely being paid to disseminate false information are banned it is in all our interests. Climate change is becoming more destructive and deadly every year, the wildfires in California now are just the opening stage of this catastrophic process. Sites like Skeptical Science and those who are involved in presenting the real story based on clear evidence are working in the interests of our entire species against what is now obviously an existential threat. Phillipe - that graph needs wider publicity. A lot of deniers see climate action as a threat to their car - justified to some extent - but understanding that coal electricity generation and agricultural are more important is helpful. However, the emission graph depends on your country. Here (NZ) it is roughly 50% transport / 50% agricultural (thermal electricity is a small player). When your economy is based on agriculture (particularly dairy with high methane emissions) and tourism (which needs air and car transport), it can be pretty sobering. I listen to talkback radio sometimes (please forgive me) and you hear the same characters phoning in with the same often identical comments in a certain type of style and usually related to climate change denial and small government ideology etcetera. I can't be sure, but it looks like they work for libertarian leaning lobby groups paying them to saturate the media. These people are organised, and to them the means justify the ends and they don't give a damn about standards of ethics, fair play or integrity. Cherrypicking is their middle name. The book Dark Money is very illuminating. I'm a free speech advocate, so I dont think climate scepticism should be banned as such, but I think repetitive propoganda, and wild claims should be culled out. Give people are change obviously, a warning, and don't be over zealous either as it alienates people on all sides of the debate and nobody will post comments. Bit of a balancing act I guess. A certain other climate website (won't name names) has a very slack moderation policy, and their website is a total mess imho full of repetitive denialist propoganda, political rants, and personal insults often among the warmists themselves, which is just embarrassing. It's counter productive, they are shooting themselves in the foot. Philippe @ 9: Air travel is not the most urgent emission source to tackle. Getting rid of coal burning and slowing deforestation would achieve far more than reducing air travel. It's an easy one to target however, given that 78% of air travel is a recreational activity for relatively wealthy individuals. On the other hand, deforestation today is mostly ocurring in developing countries of Asia and South America, as a consequence of economic development. Art, that may be so but there is something about expanding effort where it will bring maximal return. I frequently comment on Climate Change articles at Yahoo. I'm Sunspot there too. I present them with scientific facts. I don't care who "believes" me or not. Just the fact that the truth is there helps counteract all the lies. I also frquently call out the trolls, and I call them Russians. Which may be true. There are people over there - "Gooner(something), "It's Me", "Fun", and numerous others are regular features there and must be getting paid to spend that much time at it. I'm retired. It seems futile sometimes, but there are times when I get thanked for explaining something concisely, like I did yesterday with the old "but they predicted an Ice Age in the 70s" song. My favorite question this time of year is "Do you know what causes winter?". Because they don't! They really expect Global Warming to eliminate winter. But nobody ever explains the seasons. And with all the discussions I've seen on the TV, I have never seen an explanation of why it gets cold in the winter. If we don't educate ourselves and others, it's truly over... I, for one, intend to keep doing my part. Sunspot @17 , please keep up the good work! The lies find fertile soil in the scientific ignorance of many citizens ~ and fertile soil in those intelligent/educated citizens who desperately wish to believe the lies & distortions. And all of them ~ the good, the bad, and the ugly ~ are voters. Besides, Sunspot, I would hope that you find an additional measure of fun and entertainment in "Striking a blow for Liberty". It all adds up, over time. "Nothing in all the world is more dangerous than sincere ignorance and conscientious stupidity." - Martin Luther King, Jr. quotes from BrainyQuote.com." "If you think education is expensive - try ignorance"
While it is tempting to think that something like Yahoo comments presents a randomized cross-section of opinion, unfortunately, like most things on the internet it seems, this is far from the truth. Comments are arranged to elicit response and keep me on the page. And when Yahoo doesn't like what I am saying, the page I am on will stop getting new comments from anyone else, and the link will disappear from the main page. All clear manipulation. I call them out occasionally for it, for all the good that does. I have never seen any mention of this anywhere, but I can see it happening all the time. Sunspot @21 ~ intrigued by your earlier comment, I chased up the comments column of a Yahoo climate article. The article was quite fair and reasonable (on AGW effects) . . . but Oh My . . . the comments column was a Niagara of 1- to 3-sentence denialist mini-rants. Maybe 98% denialist? Absolutely no way could that represent a randomized cross-section of opinion. Is Yahoo being a magnet to half the crazy galoots in the USA? Do the crazy galoots simply join in there (having been rejected by their friends & relatives) in order to air their opinions & vent their anger? And yes, one could well believe that some of them are there as "paid actors" . . . or, in this modern automated age, perhaps many of them are simply Heartland-funded bots? What is not clear to me is Yahoo's business plan, in all this nonsense. To gain reading clicks by stirring up the crazies, allowing them to vent in an echo-chamber . . . and keep them watching/clicking? In comparison, the comments columns of WattsUp are almost half-sane. Yes, about a third of the posters are so intellectually insane that they totally dismiss the global warming mechanism of CO2/GHG's. And three-quarters of them are rabid political extremists, to whom the term charity (let alone the word tax) is anathema. A further one-fifth are such victims of their own Motivated Reasoning, that they say that around 90% of recent rapid global warming comes from 70-year and/or 1000-year oceanic cycles (or from cosmic rays causing clouding or unclouding . . . or whatever). I don't bother closely reading the WattsUp articles ~ they are mostly trash & sour-grapes "spin". But I do skim through the comments super-fast, lookin for "names" with a track record of sane intelligence (names such as Nick Stokes, Mosher, and a few others also worth reading) ~ posters who are cool oases in that intellectual desert. There is one way to talk to climate "sceptics" I find effective to silence them. It works particularly well, if it is possible to communicate about the deniers in a way that they perceive it but are not addressed directly, as is sometimes possible, e.g. in comments on Facebook. Often, when they flood social media content, it is nearly impossible to argue with the "sceptics" and be convincing. The deniers hardly ever give in. Consequently they end up having the last word, the last comment in any thread, which is not a desirable outcome for climate communicators. To try and prevent this outcome it may be explained that climate denial serves to avoid a feeling of guilt. But the results of this strategy are mixed at best —my experience. The deniers then may explain that they don't feel particularly guilty. (Of course you don't feel guilty. That is what your denial is meant to achieve! You should not feel guilty at all when you claim there is no problem at all. Or do you, nevertheless, acknowledge that there is a problem?) And there we go, the debate continues. However, I repeatedly made the experience that deniers almost always discontinue the debate if they are told that their ultimate reason to deny climate change is to be free riders, that they want to let others solve a problem and that their stance is an immoral one. For example, an article (in German) about the discovery of the atmospheric greenhouse effect triggered a debate on Facebook. 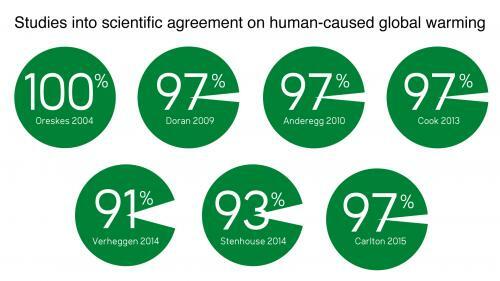 Nearly half the comments (39 of 94) written over two days originated from 19 climate deniers. Some commentators patiently tried to counter the deniers by explaining the science of climate change, others tried with sarcasm —all in vain, as usual. There was the usual aggression and contempt on both sides. However, a series of three posts in the main thread (not as a reply to one specific denier's comment) pointed out that the ultimate goal of climate denial, including the psychology at work, was free riding and that deniers necessarily believe in a conspiracy but that they are mislead by the fossil fuel special interests, not the climate scientists. These simultaneous explanations stalled the debate effectively. The positive results I received in several experiments may be coincidental. I don't have any statistics. But I believe the outcome is not accidental. It may be explained: By denying the problem, the deniers seek excuse and psychological relief from acting immorally. By telling them that their position is nevertheless an immoral one, their stance becomes less tenable. The deniers also seek to avoid criticism or even retribution for their immoral stance, their denial and free riding. By talking not to them, but about them (if possible), they are signaled that their intention to prevent criticism should be exposed. Actually in any specific case, their intention is thwarted. In combination with the accusation to ultimately act immorally, their denial becomes unproductive and they tend to give up. This communications strategy —if it is a strategy at all— probably doesn't convince the deniers. It might even rather have the opposite effect. (If you want to be convincing, there is advice.) But experience shows that it quiets them. In light of the deniers' influence in the public sphere and ultimately politics, that may be more important than most people think.